When Deadpool: The Gauntlet came out as a web-first Infinite Comic, it struck me as odd that Marvel would pick that format for a story that would eventually have a huge impact on the character. It took only a few pages of the comic in motion to understand why this was done: the panel animations are perfect for a character as wacky as Deadpool. Though it's since been collected in a physical trade -- and retitled as Deadpool: Dracula's Gauntlet to differentiate it from the lengthy Amazing Spider-Man: The Gauntlet -- it's best read digitally to appreciate the work put into this unique piece. The biggest advantage of the Infinite Comic format is the ability to modify panels so that different characters and objects appear in them with a simple mouse click. This is demonstrated right at the beginning with two parallel panels used to show Deadpool ejecting a bullet that's been fired into his heart. The panel on the left shows his changing facial expressions, while the one on the right shows the bullet being removed and the wound sealing up. His yellow word balloons move from one panel to the other as the reader's attention shifts. It's such a fluid motion that you almost miss the joke he makes about John Denver being a famous mercenary. Throughout the book, panel shifts are used to bring half-page character bios in and out when new people are introduced, removing the need for more obtrusive and permanent captions. It's telling that Reilly Brown is credited with both art and storyboards; even though the latter is part of a spoof of a James Bond credit sequence, Brown had to map out how to integrate the story into the moving panels and text. A longtime Deadpool artist, Brown was drawing Deadpool in the current aesthetic years ago in Cable and Deadpool; the art for the Brian Duggan and Gerry Posehn run matches his style rather than the reverse. Scott Koblish also helps out in later chapters of the book to help keep up the frenetic character introductions and action sequences. Each shift of a panel or caption is counted as its own "page" on Comixology, so at over 860 pages, this is likely the longest Deadpool trade of all time ... technically. Due to the nature of the Infinite Comic medium, the plotting of Deadpool: Dracula's Gauntlet seems both too thin and just about right. There's more than enough plot for a six-issue miniseries, but that's spread out over thirteen issues, each of which is a little over half of a regular issue plus extra panels. 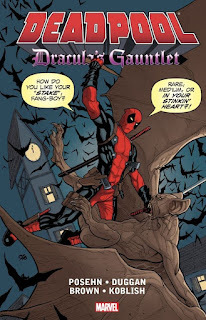 It's a madcap chase series set around a solid premise: Deadpool is hired to retrieve Dracula's bride from her tomb; she falls in love with Deadpool instead. Having seen Shiklah living up to her potential as the lead in Mrs. Deadpool and the Howling Commandos, it's interesting to see her debut. Her personality is a little uneven since Duggan and Posehn give her a lot of quirks; the portrayal has since been ironed out. There's another major connection between Dracula's Gauntlet and Mrs. Deadpool: with a few exceptions, the aforementioned Howling Commandos in the latter are present in the former as either servants or prisoners of Dracula. The underground Monster Metropolis is a new concept that feels more legitimate with the presence of Werewolf by Night and N'kantu the Living Mummy. Frankenstein's Monster gets a major role and ends up being one of Deadpool's most dangerous foes by the end of the series. A new character is introduced: Marcus, the diabetic centaur who is also a werewolf and who is also bonded with a Venom symbiote. He's a scene-stealer between his ridiculous amount of power and his frequent mentions of how diabetes is his only weakness. He feels like a character that someone on the team created when they were a little kid and he adds to the randomness. Opposing these monsters and their vampiric leader is a variety of Deadpool supporting characters both past and present. This takes place in between the pages of Deadpool vs. SHIELD, so Agents Preston and Adsit are busy there. Michael the Mage and the Ghost of Benjamin Franklin represent the current cast and put on their best showing since their introductory arcs. Joining them later on are the Red Hulk's Thunderbolts, who don't do a lot on panel but do prevent the formation of a plot-hole had they been absent. The big return comes from Bob, Agent of HYDRA, one of Reilly Brown's' creations with Fabian Nicieza in the pages of Cable and Deadpool. While his haplessness went way over the top in Daniel Way's book, it's nice to see him back and semi-competent, plus his presence leads to a war between AIM and HYDRA that even involves MODOK. Because of its length and loose pacing, Deadpool: Dracula's Gauntlet would make a really good airplane read. It's episodic but still compelling enough to make you want to keep reading. Even if you're not all that deep into the Duggan and Posehn Deadpool arc, there's lots of shenanigans and recognizable characters. It might even make you a fan if you weren't one before. If you can, get the digital version: not only is it the format that the title was designed for, but it's also less than half the cost of the trade version.